Dixie Lee Wells, 73, of Middletown, died Sunday, January 27, 2019, at Ohio's Hospice of Butler & Warren Counties. She was born in Middletown on November 4, 1945 to parents John and Mary Helen (McIntosh) Pergram. Dixie was an avid tennis fan and enjoyed watching the ATP. 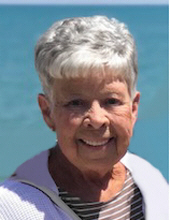 Mrs. Wells is survived by her daughter, Dara (Brian) Laforest Miller; stepchildren, Taryn (Brent) Nance, Rob (Kitty) Wells & Sondra (Chris) Liensch; sisters, Joyce Barnett & Cheryl Prater; seven grandchildren, Mary Paige, Zane, Jenna, Carly, Travis, Kyle & Christian; and five great grandchildren. She was preceded in death by her husband, Robert O. "Bob" Wells Sr.; parents; and siblings, Paul Pergram, Janet Short & Jack Pergram. Funeral Service will be held Friday, February 1, 2019 at 11:00 am at Wilson-Schramm-Spaulding Funeral Home, 3805 Roosevelt Blvd., Middletown with Pastor Marshall Duke officiating. Visitation will be Thursday from 5:00 - 8:00 pm at the funeral home. Interment will be at Woodside Cemetery. Memorial donations may be made to Ohio's Hospice of Butler & Warren Counties, 5940 Long Meadow Dr., Franklin, OH 45005 – OR – the Roger Federer Foundation online at rogerfedererfoundation.org. To send flowers or a remembrance gift to the family of Dixie L. Wells, please visit our Tribute Store. "Email Address" would like to share the life celebration of Dixie L. Wells. Click on the "link" to go to share a favorite memory or leave a condolence message for the family.